Using Dragonfly, van Dokkum and colleagues found a large, sparse galaxy called NGC1052-DF2 in the northern constellation Cetus, also known as the whale. It’s as big as the Milky Way but with only one percent of its stars. Then they used larger telescopes on Hawaii and eventually the Hubble Space Telescope to study the galaxy. Even though the galaxy is mostly empty, they found clusters of densely grouped stars. With measurements from the telescopes, van Dokkum and colleagues calculated how fast those clusters moved. If there were a normal amount of dark matter those clusters would be speeding around at about 67,000 mph. Instead, the clusters were moving at about 18,000 mph. That’s about how fast they would move if there were no dark matter at all, van Dokkum said. Van Dokkum dismissed both possibilities. “It’s sort of non-negotiable. There’s nothing else, just the stars,” he said. The only way this can be explained is if dark matter exists in the universe, just not in that galaxy, he said. 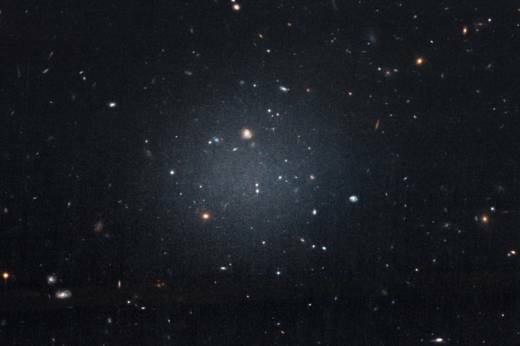 There’s no good explanation for why and how this galaxy has no dark matter, van Dokkum said. He proposed four different possibilities — all unproven. His favorite: That the galaxy formed in the very early universe in a way astronomers have never seen or understood.